"I created this recipe after experimenting with many different types of frozen-fruit smoothies. My husband and I no longer make it except when we're hosting guests in our home in Hawaii, as we were drinking it too often (and it is certainly not a low-calorie beverage). It is an awesome substitute for frozen alcoholic mixed drinks." 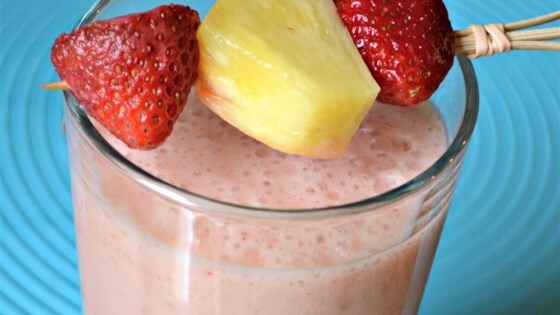 Blend pineapple, strawberries, cream of coconut, and vanilla extract together in a blender until smooth. Absolutely delicious. Even better with vodka. I used fresh pineapple & strawberries. I added a small can of pineapple juice to make up for using fresh pineapple instead of canned with juice. This is a nice, refreshing and tasty smoothie.